Cyborg hacks into a staff taken from one of Rao's prophets. He is overwhelmed processing the vast amount of information in both the staff and the Cathedral it uplinks to. But, as it turns out, there are thousands of cathedrals dispersed throughout the galaxy. With this technology, billions of people are linked to Rao, feeding him power. Stranded on Mount Olympus, Wonder Woman and Aquaman raid the god's armory in preparation for battle. Argo City, 250,000 years ago, a young Rao and Hal Jordan enter a modern day Infinity Corp building. They encounter their previously unseen enemy, Rao: from the future. The older, and more powerful Rao plans on recapturing Krypton. Inside another time's Infinity Corp building, The Flash and Dr. Vincent brace as the building crashes "somewhere." Superman is held captive in the heart of the cathedral. His plea for Rao to be honest with the people of Earth falls on deaf ears. Rao plans to genetically modify human DNA into an Earthling/Kryptonian hybrid. This will feed him even more power. Still bound, Superman crashes Rao's Cathedral into the moon. Story - 3: Today, many mainstream comics suffer from decompression, or writing for the trade. For this reason, fans want short arcs or one-shots. But those formats make it difficult for big ideas, like the one Hitch has developed in this arc, to breathe. Instead of stretching the story out into a twelve issue arc, Hitch needs to develop his story into a twelve issue arc. There's a difference, but unfortunately, this writer's strength is not story development. Like previous issues, our heroes are ushered through Hitch's plot instead of working their way through it. It is difficult to adequately utilize seven different protagonists, but it is worth mentioning that some of them have been worthless. 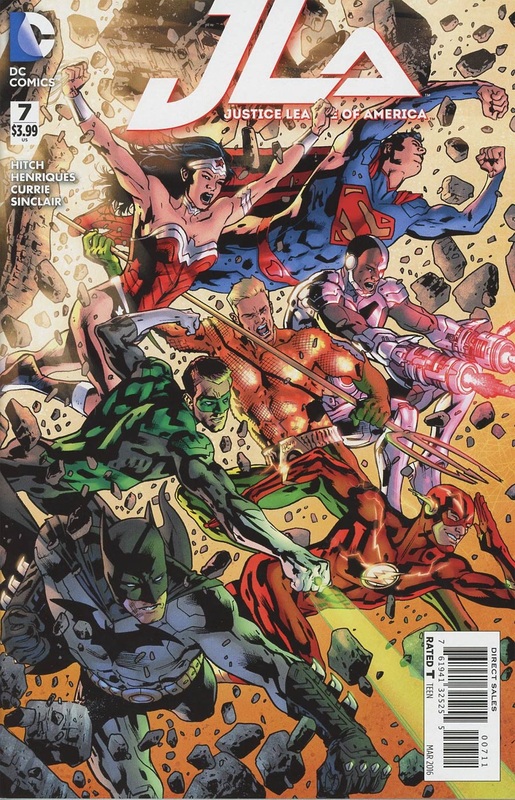 Issue after issue, Aquaman, Wonder Woman, and Cyborg do little to nothing, but Batman in particular stands out. Despite trying to solve problems, i.e., challenging Superman's support of Rao, performing a cat-scan on a victim, and bringing Cyborg a piece of Rao's technology, the Caped-crusader mostly stands around talking. Hitch has come up with a good idea, it's entertaining, but he does not understand how to properly execute it. In this issue, we get confirmation that, aside from capturing Superman, there is another reason Rao has come to Earth, he's looking for something. But as interesting as the new information is, readers do not feel its importance or immediacy. Rao is not worried, he is not rushed. Rather, he is winning in a landslide, and has no reason to be concerned about the fact that they have not found what they are looking for. If Hitch could find a way to put a "ticking clock" on Rao's search, the stakes would be raised, and the reader would be more engaged. Not only is Rao unchallenged, but the same can be said for all of the other characters, that is, except for Superman. He is bound and beaten, but he finds a way to overcome that obstacle and still accomplish his goal. Though he cannot move, he is the only character in the story that takes action. In doing so, he gives us the most satisfying moment of the issue. The moment Superman crashes the Cathedral into the moon may become an instant classic, but the story that frames it is lacking. Art - 4: Hitch continues to deliver an above-average issue visually, but the dueling problems of being behind schedule, and not having anything to draw besides information exchanging conversations combine for an underwhelming effect. With an effort like this from an artist of this caliber, one is hard pressed to find problems, but the thought will always hover a reader's consciousness, "He can do much better." 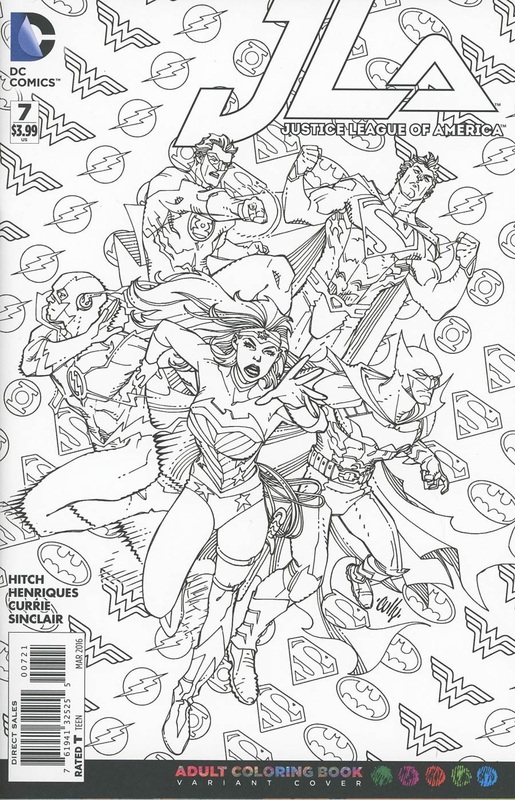 Cover Art - 3: I love a great shot of the classic Justice League members together, but there are only so many group shots an artist can come up with in seven issues. Hitch needs to break up the monotony and focus on some individual conflicts. Superman bound in the Cathedral, or Wonder Woman stranded on Olympus. Anything but this. We are too far deep into the series for such a generic cover.